John Coulter : Surf landing in Marquesas, 1836.
returning again by the South Pacific to the Polynesian group, and finally fitting out the ship for home at Tahiti, from whence we sailed over to Eimeo, took as passenger on board a missionary, who had been a great many years on these islands, Mr. Armitage and his family, and arrived in London in 1836. The scene is a very noisy one ; the jabber of the natives in the canoes trading, the men in the boats shouting directions to each other, the water all round literally covered with women, and children swimming about. visit, the canoes were taboed from the women ; they were not allowed to enter them ; so that when they chose to gratify their curiosity, they were always obliged to swim for it ; but that appeared to be no inconvenience to them, for they would swim, and appear to enjoy themselves in the water for hours together. The canoes are long and narrow, yet not likely to be easily upset by any one that has had the slightest experience in their management in the surf or smooth water. Any liability to capsize is counteracted by the out-rigger that all the Marquesan canoes have attached to them. which it is to be attached. Into this there are forked sticks inserted, and lashed firmly with a very strong cordage made from the fibrous part of the cocoa-nut. Then there are stretchers extending from these forks to the gunwale of the canoe, also well secured, which keeps the out-rigger firmly in its place in the water, at a distance of two or three feet from the canoe itself. The fore and after part of this novel boat is merely a projecting stage, on which a native will balance himself standing, either giving directions, or steering with a long paddle. The aspect of a well-tatooed native thus situated, or thus employed, is both bold and graceful in the extreme. An idea may be formed of the strength of the canoe and its appurtenances, when I state that, with apparently perfect ease and coolness, they will drive it through a surf in which nothing else could be managed or live in. On out return to the southward, we made Robert's Island, the most northern of the Marquesans. 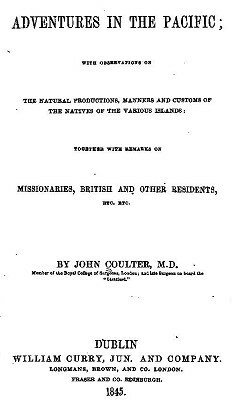 It is in sight of, and not far from Nukahiva, It has been always uninhabited, and seldom, though sometimes visited by the natives of the other islands. sport with the wild hogs and goats on it. Having been now well prepared with every necessary in the boat, we pulled towards the only safe landing-place on the island, which was a steep, stony beach of about two hundred yards in length, with a heavy surf lashing up on it, and the adjacent rocks, to a great height. Indeed, the swell breaking against the shore appeared almost too great to attempt a landing. However, after gazing at it for some time, and seeing that we could get a chance now and then to run the boat in, the captain determined to try it. So we prepared accordingly, making every thing in the boat fast, and carefully rolling some of our clothes round the guns to keep them from the sea water, of which we anticipated a good sprinkling. We now watched our opportunity for the smoothest swell ; and when the time seemed favourable, pointed the boat in for the landing. The heaving up of the deep sea got under us, and lifted us to a fearful height ; then the high crest of the wave broke, thundering and boiling all round us, the spray covering and nearly blinding every one. From the top of this surf the boat plunged down into the hollow, or bed left after it, with so violent a shock, that nearly all were unseated, and the oars unshipped.
" Lay fast hold of your oars there — mind your steering. Bill — point her fair in." Another tremendous swell now made in, like a large hill, after us. blinded up on the beach. Every one now jumped out, laid hold of our fine whale boat, and ran her up high and dry on the beach, out of the reach of the surf. Now that we could stand steadily and look at the high barrier of boiling foam we had passed through, we could not avoid wondering how we got in without a capsize, or the destruction of the boat, and consequently ourselves. Nothing but a good whale boat, well handled, could live through it. If we had had any idea of the extent of the surf, we would not have attempted to land, as the greatest danger is in getting out again. I may here remark that it is a matter of difficulty to ascertain the extent of a surf until you are fairly in it. A great deal depends on the occasional heavy swell meeting a gradually deepening, or suddenly steep beach. In the first case, the body of water heavily washes high up ; in the latter. meeting with an abrupt resistance, it bursts like thunder against beach and rocks, and sends its glistening spray high into the air, to fall again in on the land with a roaring noise, like a bursting water-spout. At the full and change of the moon, the surf becomes very heavy round all these islands, and generally continues for two or three days, often longer, to lash the shores with much violence — I may say fury ; and though our landing was hazardous, yet we had a comparatively quiet time of it to what we afterwards witnessed. Shortly after our coming on shore, the sea came rolling towards the land in large swells, and the surf broke so high, that we were obliged to shift the boat away further inland out of its reach. a large bed of diamonds tumbling on the beach ; and although the weather was particularly fine, it was quite evident we would be obliged to remain on shore until the violence of the swell subsided. The captain was uneasy about getting off to the ship ; but as to the boat's crew and my- self, we were all pleased with the idea of two or three days* amusement through the island. Geoff Cater (2013) : John Coulter : Surf Landing in Marquesas, 1836.